The house was beautiful and in the perfect location! It was an easy drive to various areas in Vikos and about a 8 min walk to the center. We liked the jacouzi and the fireplace inside the room. We also liked the location. The beds were very comfortable. Good view from the well decorated room. Fairly easy to park next to the hotel. The hotel is run by a very friendly family. We hiked the Vikos gorge and i could order a lunch package with them to take with me. And they picked us up by car when we arrived at Vikos after the 6-hour walk from Monodendri. Brilliant location. Accessible with great views over mountains from balcony. Short walk to square and monastery. Comfortable room. Friendly helpful manageress who gave helpful tourist information. Brilliant value. The restaurant has great food! And the hosts are very helpful- giving advice on day trips and attractions . Enjoyed our stay very much! Lock in a great price for Archontiko Zarkada – rated 8.7 by recent guests! 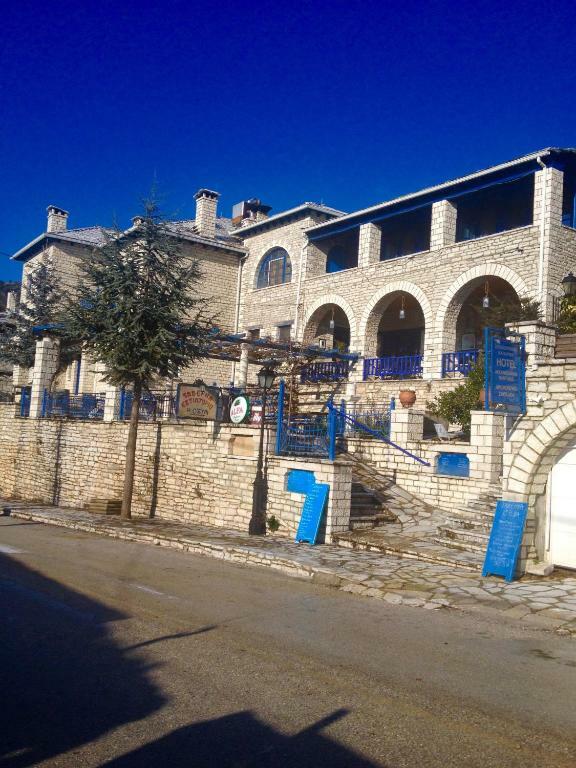 Located 650 feet from the central square of the scenic Monodendri, stone-built Archontiko Zarkada offers rustic-style accommodations with free Wi-Fi and balcony overlooking the village or Vikos Canyon. The traditional restaurant serves local specialties by the fireplace. Featuring wood-carved ceilings, elegant lamps and lace curtains, rooms at the Zarkada have an LCD TV and DVD player, fridge and hydromassage shower or spa bath. Some rooms also include a fireplace. A breakfast buffet including local yogurt and fresh fruit is served in the dining area. Snacks, drinks and local spirits are provided at the bar and when the weather is warm guests can have coffee on the terrace that is surrounded by a lush garden. Free access to a gym is available and there is also a hot tub on site. Staff at the tour desk can arrange hiking and rafting activities in the area. Vikos Canyon is 1,650 feet from the property. The town of Ioannina with Lake Pamvotis is at 23 mi and Ioannina Airport is 23 mi away. 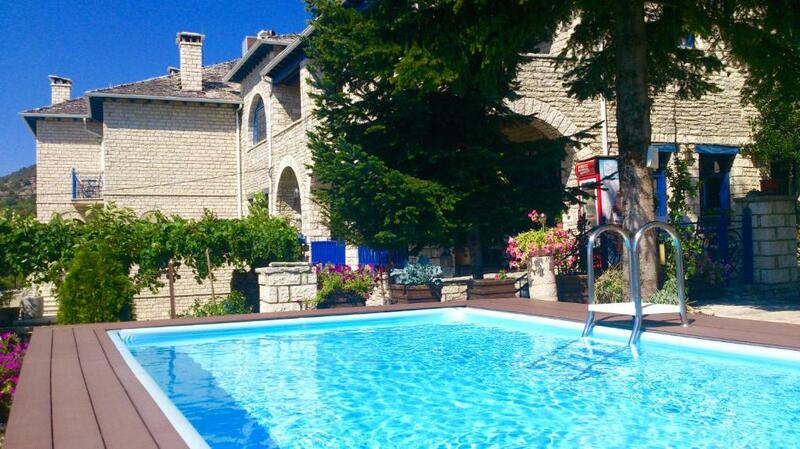 When would you like to stay at Archontiko Zarkada? Rustic-style accommodations with wood-carved ceilings, elegant lamps and lace curtains featuring free Wi-Fi and balcony overlooking the mountain or Vikos Canyon. Includes a shower with hydromassage, an LCD TV, DVD player and fridge. More spacious, rustic-style accommodations with fireplace, wood-carved ceilings, elegant lamps and lace curtains featuring free Wi-Fi and balcony overlooking the mountain or Vikos Canyon. Very spacious, rustic-style accommodations with fireplace and a shower with hydromassage jets. Includes free Wi-Fi and a window with view. Features wood-carved ceilings, elegant lamps, lace curtains and a sofa. Equipped with an LCD TV, DVD player and fridge. Featuring a fireplace and mountain view, this spacious quadruple room is fitted with 2 double beds. Spacious room with fireplace and mountain view. 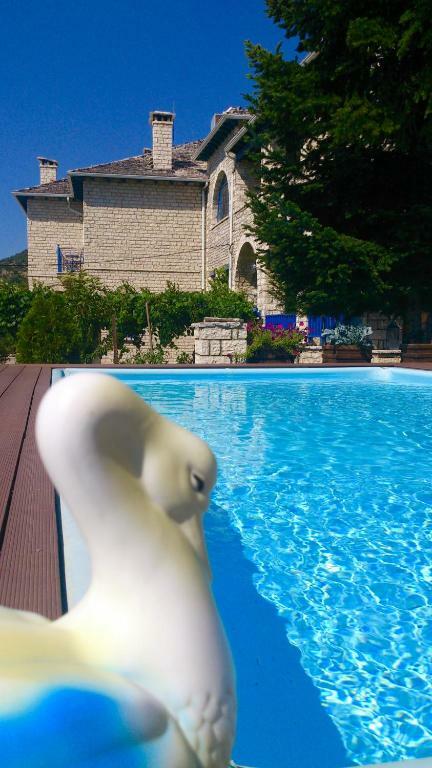 Spacious, rustic-style accommodations with fireplace, wood-carved ceilings, elegant lamps and lace curtains featuring free Wi-Fi and balcony overlooking the mountain or Vikos Canyon. Offering a spa bath, this spacious, rustic-style accommodations comes with a fireplace. 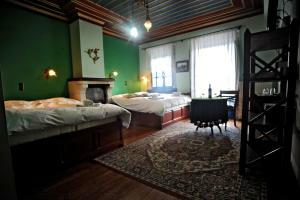 It has wood-carved ceilings, elegant lamps and lace curtains and features free Wi-Fi. This twin/double room has a DVD player, hot tub and patio. This twin/double room features a balcony, hot tub and CD player. Tο Αρχοντικο Ζαρκαδα mountain k eco hotel ειναι ενα πετρινο παραδοσιακο Ζαγορισιο Αρχοντικο,στο ξενοδοχειο μας δινουμε ιδιαιτερη βαρυτητα σε ντοπια προιοντα για την κατασκευη του πρωινου κ του δειπνου,ενω η πρασινη πολιτικη του ξενοδοχειου ειναι προτεραιοτητα μας. Ειμαι αποφοιτος γυμναστικης ακαδημιας ασχολουμαι με το ξενοδοχειο απο το 2001.Μου αρεσει το περπατημα,ο στιβος,το rafting,το ποδοσφαιρο κ η φωτογραφια. η γειτονια του ξενοδοχειου ειναι ησυχη,την Ανοιξη κ το καλοκαιρι η μυρωδιες απο τα ανθη αναβλυζουν. House Rules Archontiko Zarkada takes special requests – add in the next step! Archontiko Zarkada accepts these cards and reserves the right to temporarily hold an amount prior to arrival. Please note that the property accepts PayPal as a method of payment. Bedlinen and towels had stains and cuts. Bathroom door didn't close. Shower glass door was not clean. Breakfast was pretty standard. A kettle in the room would have been a nice convenience. No soundproofing, but we were lucky not to have noisy neighbours. In general there were a few off-putting details that make quite a difference. Very spacious room and huge bathroom. Bathroom amenities were provided. It was extremely noisy. You literally hear EVERYTHING. Also, to us it was disappointing that the gym was closed. It was one of the reasons why we chose this hotel. Nice breakfast with local products.comfortable bed.excellent views in a good location. WiFi was not working at the first night (fixed at the second night). The pool's water could have been warmed. The people that run the place are not friendly. Breakfast was poor. Be aware there are no grocery shops in the vicinity. Offers nice views and is in a decent location to explore the area. No heating in the rooms. Since the weather at the time we arrived was quite cold and rainy, we had wet clothes and shoes - there was no electric heating even in the bathroom. So we had no possibility to dry up it. Run by a very friendly family. Peaceful location. Excellent breakfast.